I think I’m getting better at photographing myself. It’s very cloudy and grey tonight, but I did manage to take unblurry pictures with the self-timer. Yay! I’m still bent on getting a real tripod, following Kathryn‘s excellent advice, so I can shoot from a greater distance (3 metres instead of 2) and thus take the whole of myself, not just the upper two thirds. This way, I should also be able shoot from a perspective other than a low angle (as in these pictures… I’m actually looking down at the camera). So far, I’ve been taking pictures with a baby tripod we got for free ages ago; it is not very stable and is only 14 cm/5.5″ high (I put it on my desk; adding some height with dictionaries under the tripod doesn’t provide enough stability to the camera). Back to sewing! 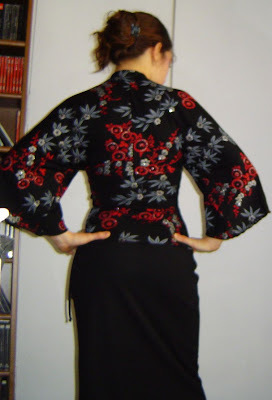 As I was saying, this is Simplicity 4020, view D: a fitted knit empire top with kimono sleeves. It is also part of my Autumn/Winter Wardrobe. The pattern has been in my stash for 6 months and I’m glad to be finally using it. 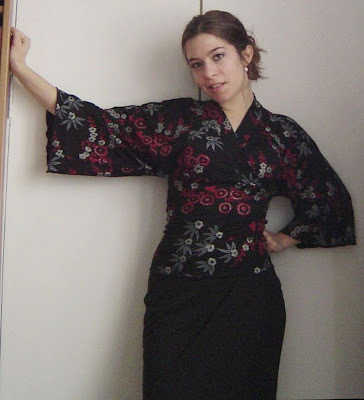 Of course, with my japanesque fabric, I HAD to do the kimono sleeves version. I cut it in a size 6, but the upper section could do with a bit more space in the bust. I should probably have graded the front parts into a size 8 or 10. This is usually what I do, but with the stretchy fabric I thought I might get away with making a 6 all around. Lesson learned! I forgot to mention this in the previous post, but that fabric is absolutely terrible to work with. The machine kept skipping stitches. I ended up stabilizing the seamline with strips of tissue paper, and had to play around with the tension a good deal; even then, I had to re-do almost every seam several times. This is perhaps due to the glitter? Any ideas or tips? They would be most welcome. 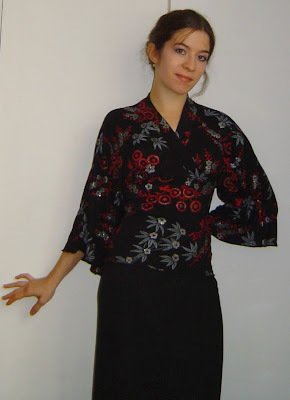 I like the fact that, unlike many wrap tops, the neckline is high enough to prevent any risk of gaposis. I also stretched the heck out of the neck binding when attaching it to the neckline (making it shorter than it was supposed to) to make sure the neckline would be hugging the neck. This top is perfectly suitable for work (I took the pictures tonight just after I got back from work). I couldn’t match the print in the back seams because there wasn’t enough fabric left to play around. With such a busy print I’m not sure it’s a big bother, though… what do you think? The style and fabric are perfect for each other! 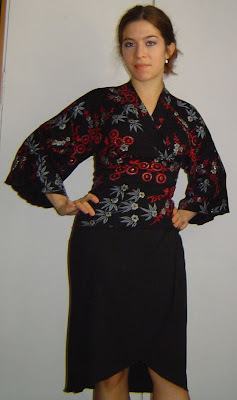 I have a kimono style blouse and I get so much use out of it – looks dressy without trying too hard. J’adore ce modèle! Il te va très bien d’ailleurs. J’aime que tu aies taillé les manches plus longues que ce que semble indiquer le dessin de coupe. J’aime aussi l’encolure plus refermée. Très bel ensemble!!! Félicitations!!! Dear Isabelle, your top is just gorgeous. It suits you to the T. I wouldn’t have noticed the difference at the back if you hadn’t pointed it out to me.Love the picture of little Robin. Must be exciting know that he has taken his firt step. You look great, Isabelle, and Robin is utterly adorable!! I love this top! You and I really have similar taste. This top is really flattering on you.And of course, I always love pictures of little Robin. He’s getting so big, your sister must be so proud!Stay warm. Your new top is gorgeous Isabelle! I love the neckline on it (I’m always afraid of the gap opening on lower cut wrap tops – who wants to spend the entire day adjusting their clothes!! )Robin is walking – wow! Seems like yesterday we were celebrating his safe arrival. I just love your two recent tops. That fabric is stunning and really suits you. Isabelle, I love your new top, it is beautiful. You looke lovely in your self-portraits. I love this outfit on you, Isabelle. It’s a bit different for you, I think, the dark color. Very interesting and very nice! Oh, my, goodness. That is a gorgeous top. You look FABULOUS in it. I second what nowaks said. It’s probably not the glitter, but it definitely could be the needle. You really need a mictotex needle for the new stretchy/slinky fabrics. They are knit quite differently (thinner stronger threads, more twists) than your average cotton knit or even cotton double knit.And your pictures <>are<> getting better! People ask my husband what camera to buy all the time, but it really isn’t the equipment, it’s the photographer and their “eye”. If you don’t have a naturally artistic eye, you can definitely get better by just practice, practice, practice. More equipment will just make your best work easier. And part of it is you seem much more comfortable in front of the camera. My husband shoots models and even professional ones can look stilted and awkward. You need to relax and be happy. It will come out in the picture. You are really getting me inspired to sew something next week. Lovely job and you look really fantastic in it! I don’t think the unmatched pattern at the back is a big deal on this top – the flowers just sort of flow together into one motif as you’ve cut and sewn it. Isabelle, this top is even more beautiful than the previous one!! You look absolutley stunning in it and the entire outfit is fabulous! I’m sorry you had a bad time sewing with this fabulous looking fabric; I agree with using a microtex needle and perhaps you could try a walking foot; sometimes it helps with difficult fabrics. I have no idea of the fabric’s texture so I really can’t tell. I hope you are having a great weekend and I owe you an email (I hope on writing it today). Many hugs! Beautiful top–the fabric may have been a bear to work with but it all looks good now. I second everything Marion (Nowak) has said. IMHO Organ produces the best needles. I don’t know if you can get them in France though. If not, let me know and I’ll ask my dealer to send you some! The pictures are great and the top is tdf!!! The fabric and the pattern are a great match! Je suis épatée que tu arrives à te prendre si bien toute seule en photo! Ton top est ravissant, on dirait presque même que tu as un petit air japonais avec 🙂 Quant au mignon Robin, il est bien précoce pour marcher! Hello my dear friend !Ouch, I’m too tired to think tonight … j’adore ce nouveau haut, il est vraiment superbe, la forme, le tissu. Je m’intéresse beaucoup au Japon depuis quelques mois déjà (cela sa voit dans mes lectures…), et l’esprit de ce modèle me plaît beaucoup, avec ses larges manches …Gros bisous et bon week-end ! that top is so pretty!!! great job Isabelle!Cute picture of Robin! You look great in this top, very nice this version too. And as to taking pictures with a loose standing camera: I almost destroyed my two month old camera when I tried to take pictures of myself for my blog and it fell to the ground. The glass was loose, but could be readjusted. Just a warning, be careful. Your nephew is just so cute! I really like your top too. Very nice. This is one of the most beautiful tops I’ve ever seen and you look gorgeous in it! Chapeau! This top is very flattering on you. I love your skirt! tres joli ce top , il te va à ravir ! et bravo pour les photos ! c’est super ! I love both of the tops, especially this one. I might have to go get this pattern. You are just such a sewing enabler. 😉 You are inspiring, though, and that’s a terrific thing!